Stage 3 fortunately panned out precisely as anticipated. Pierre Rolland attacked on the final climb to collect the mountain points, the peloton split on the tricky descent with Chavanel looking to make an attack, and Simon Gerrans impressively held off Peter Sagan to take the win at a nice 33/1. The three stages in Corsica have been as chaotic as many expected with crashes galore and exciting finishes, but most importantly, none of the leading contenders have lost any time on each other. 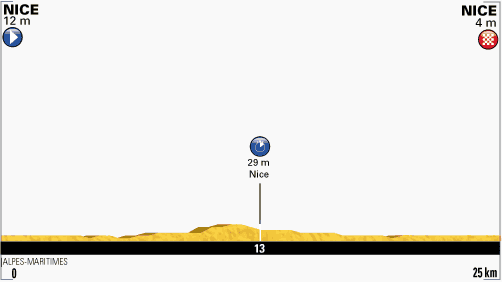 The fourth stage sees the peloton return to mainland France in a time-trial based around the town of Nice. It is a virtually pancake flat 25km time-trial course with very few technical corners that should suit the big power time-trial riders. The first section is the trickiest as the riders navigate their way through the town, but once they have left Nice, it is all large well-paved roads with little in the way of challenges. The finish is right along the seafront, so the teams can simply power their way home. The betting suggests that there are three teams that are likely to challenge for the stage win, with three further teams as possible outsiders to crash the podium. Omega Pharma Quick-Step are the bookmakers favourites, although their preparation for this stage has been wrecked by a disastrous start to the race. Tony Martin, the two-time world time-trial champion, would have been a big part of their tactics for this stage, but he went down hard in the crash in the first stage and is unlikely to be on top form here. Niki Terpstra crashed in today’s stage on the descent, while Mark Cavendish is recovering from bronchitis. Despite all this, they still have a powerful team and Michal Kwiatkowski and Sylvain Chavanel have looked in good form thus far. Throw Peter Velits into the mix with shorter turns from Tony Martin and they are still likely to challenge for the victory. Garmin-Sharp are another team strongly fancied by the bookmakers. They have an incredibly strong team with very few weak links. 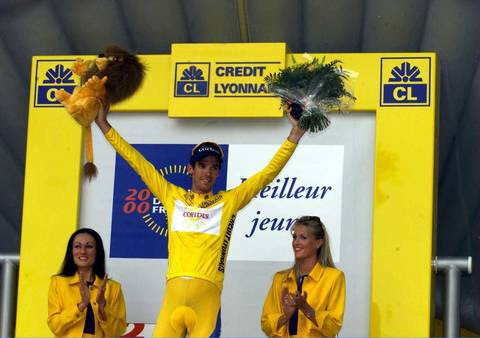 David Millar has won Tour de France time trials in the past, Rohan Dennis showed his ability in finishing second in the Dauphine time trial, while the likes of Ryder Hesjedal, Andrew Talansky, Ramunas Navardauskas and Christian Vande Velde are all good time-triallists. They won the team time-trial in last year’s Giro d’Italia and look to be real contenders to win here. Sky are another strong outfit in this type of stage, although they have also suffered in the crashes in the early stages. Geraint Thomas is rider with a fracture in his pelvis, while Ian Stannard is struggling as well. The likes of Vasil Kiryienka, Edvald Boasson Hagen and Kanstantsin Siutsou will complement the obvious time-trial ability of Chris Froome and Richie Porte, but there will always be the thought that those two will not want to overdo themselves at this early stage. Clearly they don’t want to lose time here, but there are bigger challenges to come. In terms of the outsiders, Movistar always perform well in these team time-trials. They finished second in the Giro d’Italia time-trial, although they did have the excellent Alex Dowsett to power them along. They also won the team time-trial in last year’s Vuelta with many of the same riders that they have here. 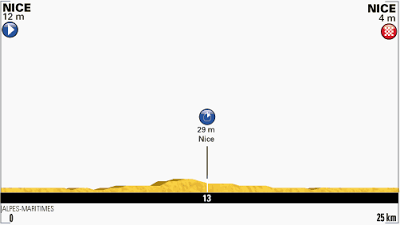 Orica GreenEdge will be on a high from winning today’s stage and they have plenty of riders that will enjoy this course. The likes of Svein Tuft, Cameron Meyer and Brett Lancaster should power them to a solid time and this is no doubt a stage that they have targeted. Without a world-class pure sprinter to contest the flat stages and with no real GC contender, they will be desperate for a good showing here. The final outsiders are BMC Racing. Tejay van Garderen is a very talented time-triallist, and while Cadel Evans is not quite at the level he used to be, he is still very capable. The likes of Steve Morabito, Marcus Burghardt and Brent Bookwalter have all done well in team time-trials in the past. They came second in the team time-trial in 2011 with many of the same riders, and while they are certainly not favourites here, they have the ability to force their way onto the podium with a good ride. Outside of those six teams, it would be a major surprise if anyone else challenged for the podium, let alone the stage win. RadioShack, Saxo-Tinkoff and Belkin are those most likely, but I do not expect to see them at the top of the leaderboard.